Learn about the Emergency Medical Technician Program at National University. 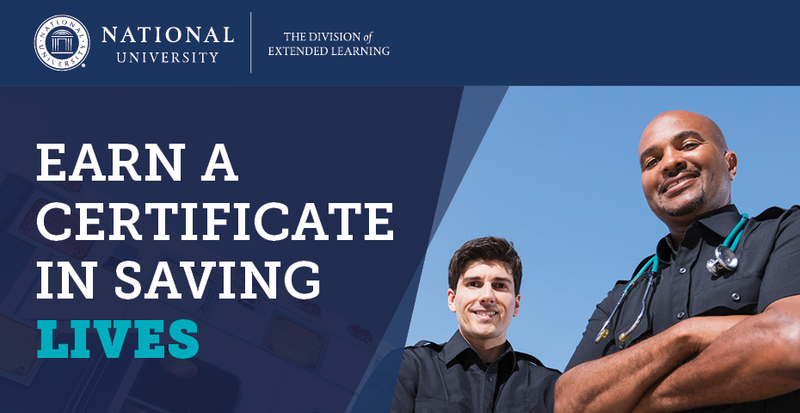 Are you interested in pursuing a career as an emergency medical technician, paramedic, healthcare or firefighter? The pathway to a career starts with training as an Emergency Medical Technician (EMT). EMTs are trained clinicians who serve as first responders in emergency situations. Prospective EMT students are invited to attend an information session to learn more about this growing field and training program. In appreciation for attending this event, your $60 application fee will be waived. The EMT program is recognized by the National Registry of Emergency Medical Technicians (NREMT) and accepted across the nation at both state and local levels. National University is accredited by the Western Association of Schools and Colleges (WASC). * National University is regionally accredited by the Western Association of Schools And Colleges (ACS WASC), the same body that accredits all major colleges and universities in the Western United States.